DETROIT -- Jerry York, who tried to get General Motors Co. to form and alliance with Renault-Nissan in 2006, died Thursday at age 71 after reportedly suffering a brain aneurysm. His death was announced in a statement by Apple Inc., where he was a board member since 1997. York (pictured), a former Chrysler finance chief, joined investor Kirk Kerkorian in pressuring GM for change. He resigned from the GM board in October 2006 after the automaker rejected Kerkorian's proposed alliance with Carlos Ghosn's Renault-Nissan after three months of study. York also advised Kerkorian in his failed bid for Chrysler Corp. in 2007. He was named to the GM board in February of that year as a representative of Kerkorian, who had built a 9.9 percent stake in the automaker as losses mounted. Initially, York called for GM to cut its dividend 50 percent, lower the salaries of top executives and reduce its stable of brands. "To get to the crux of the matter, I have not found an environment in the boardroom that is very receptive to probing much beyond the materials provided by management," York said in his resignation letter. He also said the threat of bankruptcy, while temporarily diminished, still existed because of “longer-term fundamentals” including cash flow and shrinking North American market share. Two years later, Wagoner would seek emergency federal loans while warning that the automaker was running out of cash. GM eventually filed for court protection as part of the U.S.-steered rescue that swept Wagoner from his job and left the surviving company with four vehicle brands in the United States instead of eight. “He has been a pillar of financial and business expertise and insight," Jobs said in a statement. “It's been a privilege to know and work with Jerry, and I'm going to miss him a lot." For his part, York relished Apple's intense product focus and embrace of change. In a recent conversation, he said Apple board meetings often centered on presentations of new products such as the iPad or, a few years ago, the iPhone. He criticized the bureaucratic barriers to such innovation in U.S. automakers, especially GM. York worked at Ford before joining Chrysler, where he spent 14 years and departed in 1993. In November, York said Chrysler had less than a 50 percent chance of long-term survival after its bankruptcy and rescue by Italy's Fiat S.p.A. The first big question surrounding Chrysler, York said, was timing. "Will some combination of industry sales and product -- including product from Fiat -- get there in time before they run out of cash?" The second question, York said, was perception: "As we all know, Fiat, for historic reasons, does not have a great reputation in this country." York was a former CFO of IBM Corp. He was also CEO of Harwinton Capital and a board member of auto parts supplier Dana Holding Corp.
York joined the Dana board in 2008. He was lead director and chairman of the Audit Committee. "Jerry was an enormous contributor to our Board, based on his vast experience," Executive Chairman John Devine sai in a statement. "There wasn't anything that he hadn't seen before several times. Our deepest condolences go out to Jerry's wife, Eilene, and their children. His friendship and counsel will be sorely missed." 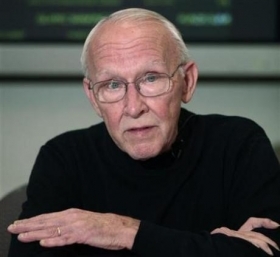 CUPERTINO, Calif., March 18 /PRNewswire-FirstCall/ -- Apple® is sad to announce the death of Apple Board member Jerome B. (Jerry) York. York, the chairman, president and CEO of Harwinton Capital, joined Apple's Board of Directors in 1997. He was the former CFO of IBM and Chrysler, and former vice chairman of Tracinda. He is widely acknowledged for his contributions at Chrysler and IBM during their turnarounds. "Jerry joined Apple's Board in 1997 when most doubted the company's future. He has been a pillar of financial and business expertise and insight on our Board for over a dozen years," said Steve Jobs, Apple's CEO. "It's been a privilege to know and work with Jerry, and I'm going to miss him a lot." &Copy; 2010 Apple Inc. All rights reserved. Apple, the Apple logo, Mac, Mac OS and Macintosh are trademarks of Apple. Other company and product names may be trademarks of their respective owners.